Fully furnished offices and meeting rooms facilities are available in a Business Centre located in the heart of Brescia and excellently served by public transport. This accommodating turnkey solution is equipped with high standard facilities and virtual office services and it is surrounded by shops, restaurants and bars. There is a gym just a short stroll away where you can stay motivated after a productive day. Ideal for small start-ups and expanding businesses this standout building provides a choice of co-working areas or fully furnished executive suites that are within a short walk of the railway station. There are great on-site facilities including meeting rooms and a business lounge where you can network with likeminded colleagues within an attractive setting. The centre is accessible 24/7, with 24-hour security so you can work through late hours with peace of mind. It is also only 25 minutes from Brescia Airport. At this centre, everything is coordinated to suit your needs so that your operations will run as smoothly as possible throughout your occupancy. This centre offers mail boxes, virtual offices, Wi-fi, HD video conferencing, translation services, secretarial services and more! 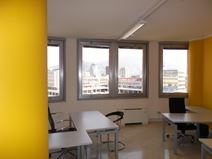 Situated in the heart of the city of Brescia, thisspace within walking distance of many fine shops, restaurants and more. This is a prestigious building, offering a warm and pleasant atmosphere for businesses of any background.